Director – Russell Mulcahy, Screenplay – Paul W.S. Anderson, Producers – Paul W.S. Anderson, Jeremy Bolt & Robert Kulzer, Photography – David Johnson, Music – Charlie Clouser, Visual Effects Supervisors – Dennis Berardi & Evan Jacobs, Visual Effects – Mr. X, Inc, Additional Visual Effects – Anibrain Digital, Invisible Pictures & Rocket Science Visual Effects, Creature Effects – Patrick Tatopoulos Design Inc (Supervisor – Patrick Tatopoulos), Production Design – Eugenio Caballero. Production Company – Screen Gems/Davis Pictures/Constantin Film/Impact Pictures. The T-Virus has spread across the planet, turning most of humanity into zombies. Alice is one of a handful of uninfected survivors who must remain constantly on the move. After her motorcycle is destroyed, Alice wanders through the desert. She uses her newfound psychic powers to save a convoy of survivors led by Claire Redfield from attack by mutant crows. Alice has found a notebook that indicates there may be a community of uninfected people living in Alaska and persuades Claire and the others to travel there. 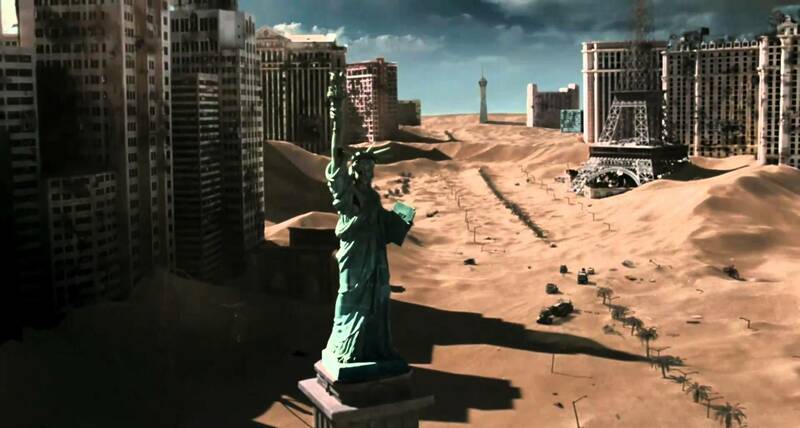 To make the journey, they need to detour to the ruins of Las Vegas to obtain more petrol. At the same time, Umbrella Corporation scientist Dr Isaacs has been given orders to find an antidote to the T-Virus and believes that he can do so by harvesting Alice’s blood. As the group fend off zombies in the ruins of Las Vegas, Isaacs tries to capture Alice. Resident Evil: Extinction is the third in the series of films that began with Resident Evil (2002). Resident Evil was adapted from the popular Survival Horror computer game and sequels in which players face off against hordes of ravening zombies. The film version of Resident Evil was popular enough that a sequel was produced in Resident Evil: Apocalypse (2004), which was then followed by Extinction. Both of the Resident Evil sequels are written and produced by Paul W.S. Anderson, director of the first film. In both cases, Paul W.S. Anderson has outsourced the direction of the sequels to other directors. Here the chores have been taken over by Australian director Russell Mulcahy. Russell Mulcahy was one of the original MTV directors who made his feature film debut with the excellent killer boar film Razorback (1984) and then went onto the huge international success of the original Highlander (1986). Throughout the 1990s, Mulcahy has maintained a steady output of genre films with the likes of Highlander II: The Quickening (1991), Ricochet (1991), The Shadow (1994), Talos the Mummy/Tale of the Mummy (1998), Resurrection (1999) and The Scorpion King: Rise of a Warrior (2008). In more recent years, Mulcahy has been working in television with mini-series such as On the Beach (2000), Mysterious Island (2005) and The Curse of King Tut’s Tomb (2006). Resident Evil: Extinction is a competent, if not particularly standout, run through of the basics that have been established by the other Resident Evil films. The previous Resident Evil films were straight-out zombie survival/action films – the first took place in a laboratory and the second expanded that to a whole city. However, Extinction expands the scale of action to the whole world and becomes a post-holocaust film as well. A reasonable budget has been thrown at the film, allowing Russell Mulcahy to create a passable depiction of a ruined world. Unlike the wimpiness of the first Resident Evil, Mulcahy is by no means unstinting when it comes to allowing the screen to flow in gore. 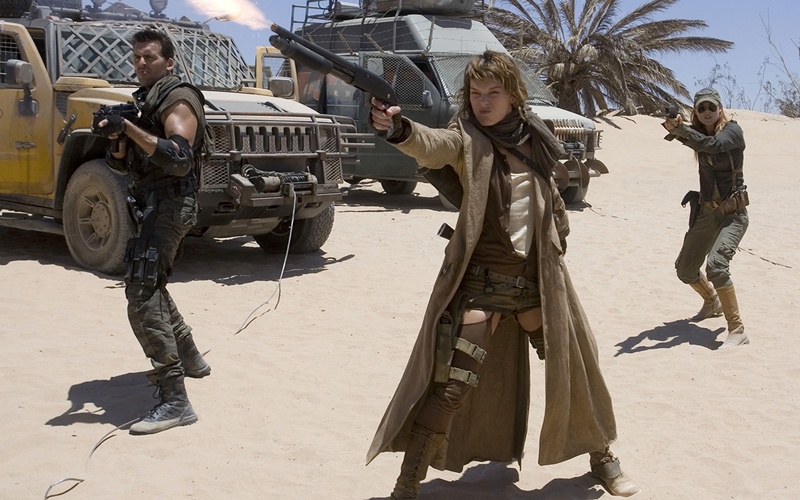 Mulcahy does reasonably well with the action element and there are at least a couple of impressive action set-pieces – the zombie attack in the ruins of Las Vegas and particularly the attack on the convoy by the mutant crows that culminates in the wow moment when Milla Jovovich appears and wields her psychic powers to incinerate the birds. On a wider level beyond that though, Resident Evil: Extinction feels like it has assembled the elements suitable for a potentially decent film but fails to push them in a way that ever builds a head of steam. The plot meanders about but not much ever happens. By the end of the film, you feel as though Extinction should have built to something far more epic in scale or more dramatically intensive than it does. Nor do Russell Mulcahy or any of the actors seem to do anything to make us connect with the characters or care whether most of them live or die. Although to his credit, Paul W.S. Anderson does a worthy job in continuing the film on from the baffling end of Apocalypse and allowing this to make sense. The one thing that Russell Mulcahy does add to the series is an element of genre pastiche and in-reference. There are a surprising number of similarities between Extinction and George Romero’s Day of the Dead (1985), which likewise escalated the scale of Romero’s zombie films to have the dead inhabiting the whole surface of the Earth and centred the plot on a group of scientists and military hidden in an underground bunker who are fighting to find a means of taming the zombies. Indeed, the scene here where a zombie starts to remember how to use a phone and a camera is remarkably similar to Richard Liberty’s experiments to get Howard Sherman’s Bub to remember things in Day of the Dead. Another film that Extinction has a surprising number of similarities is Damnation Alley (1977), which concerned a convoy of vehicles travelling across the post-apocalyptic landscape following radio messages in search of a pocket of remaining civilization, as well as featured a stopover at a Las Vegas that was filled with mutants. The scene with the crows appearing and settling on the telephone wires around the settlement is directly copied from Alfred Hitchcock’s The Birds (1963). There is also the obvious in-joke at the end of the shot of the Tokyo subway, which has been named Zatoichi Station after the famous Japanese film series about a blind swordsman. Milla Jovovich, as she has done in all the other Resident Evil films, passes through Extinction with a blank lack of expression. For some reason, as she also did in Ultraviolet (2006), her face has been digitally blurred to the point that she looks like an airbrushed character inside a videogame. Paul W.S. Anderson next returned to direct Resident Evil: Afterlife (2010), Resident Evil: Retribution (2012) and Resident Evil: The Final Chapter (2016). There was also three anime films with Resident Evil: Degeneration (2008), Resident Evil: Damnation (2012) and Resident Evil: Vendetta (2017).